Product information "Kepler downlight pendant light"
The idea for the design of the Kepler suspension from the Japanese designer Arihiro Miyake when looking at Moebius ribbons. What is inside and outside? 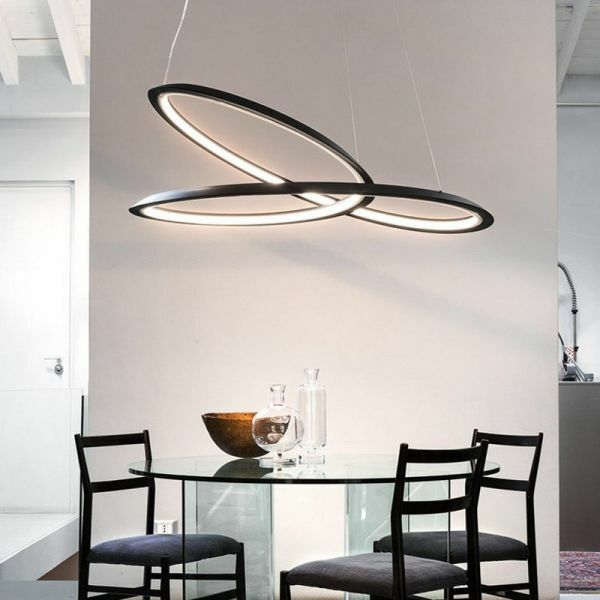 This question arises the viewer of the wonderful and noble Kepler pendant light from the house of the Italian manufacturer Nemo. Manufactured in the highest quality and with high-quality materials, the luminaire is transformed into a three-dimensional deformation process of the extruded aluminum. Equipped with a state-of-the-art LED strip, the Kepler is environmentally friendly, offers the highest energy efficiency as well as a completely maintenance-free function, which makes any lamp replacement unnecessary. This variant is offered to you as a Downlight, which throws the light downwards. Max. cable Length: 2,50m / 98,42"
Related links to "Kepler downlight pendant light"